There are many factors that have made and continue to allow California, especially the Central Valley, to be one of the most important and productive agricultural regions in the entire world. Some of the factors include the “Mediterranean” style climate, contrasting geologic features, fertile soil, dedicated and resilient farmers, and of course an extensive network of water storage and delivery systems. 1. Surface Water is water that gathers on the ground, such as rivers, streams, reservoirs, and lakes. With the central valley’s unpredictable and varying annual rainfall and precipitation, reservoirs are a critical component in providing reliable water supplies to communities and farms. 2. Ground Water is water that has absorbed into the ground. During the rainy months (October to late March) the rainwater that is absorbed into the ground will typically make its way into an underground water table otherwise known as an aquifer. Surface water is an incredibly important resource for our farmers and communities alike. Our growers take advantage of the Central Valley’s surface water resources with lakes, man-made reservoirs, rivers, and canals. 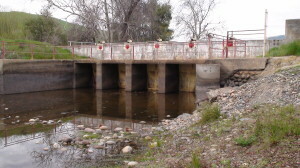 A weir to control the flow of water from the Kings River to canals for distribution across the valley. The most important reservoir for us in and around Reedley is the Pine Flat Reservoir. Pine Flat is a man made reservoir and gravity dam. While Pine Flat’s primary purpose is to control flooding it is also a critical irrigation resource for central valley farmers. In addition to Pine Flat being an average of 15-20 miles away from our growers the reservoir is massive at 30 miles long with surface area of 6000 square acres, the maximum capacity of the reservoir can hold up to 1,000,000 acre feet of water. As of 4/27/2014, Pine Flat Lake was at 29% capacity, significantly lower than the historical average of 43%. See current conditions here. The water collected in the reservoir is from the snowpack in the Sierra Nevada Mountains. The melted snowpack is stored as a precious resource until it is ready to be utilized during our dry summers. Snowpack is extremely important to our water storage as it is the main source of water that feeds into reservoirs such as Pine Flat, any lack of snowpack leads to a lack of surface water. Coupled with the dismal rainfall this winter, the current snowpack only contains 32% of the average water content for this time of year. Given the conditions, the 2014 snowpack could be the fifth lowest on record since the state snow survey began in 1930. Pine Flat feeds the stored water into the Kings River which runs 125 miles through Fresno Country and into the Tulare Lake bed. Our growers use an intricate system of canals, weirs, and even underground ditches to divert and transport the water in order to irrigate their fields. Canals are used to transport water from the river to the farmed acreage that has access (i.e. proper underground pipes to direct water flow) to this water. Weirs are small dams that are used to raise the water level and therefore allow our farmers to alter the flow of the water and diverting it to where it is needed. Underground ditches may be invisible to the naked eye but this extensive network of underground ditches is right underneath our feet and allows for the water to flow efficiently to the fields. Our farmers take advantage of the water that has accumulated into the aquifers by pumping it out of the ground to be used to irrigate land or to be purified into the drinking water. Surface water satisfied most irrigation needs until the late 19th century but as the agriculture industry grew in the central valley so did the demand for water. 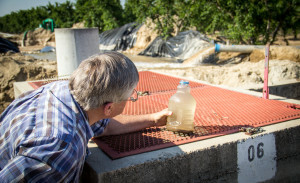 Summeripe Grower/Packer Richard Sawatzky reviews a water sample pulled from a well being developed in the middle of our Orchards. The invention of the deep-well turbine pump in the 1930’s allowed withdrawals from much greater depths and lead to the use of wells to supplement the less than dependable surface-water supplies. Wells also supply water to areas where surface water diversion canals and ditches have not and cannot be constructed. As mentioned in the previous Summeripe Focus, wells are becoming increasingly important for our farmers during these dry times. Ten years ago a specific well in our orchard was able to pump water from a depth of just 40 feet. Today, that same well settles at 63 feet. Surface water and ground water are both incredibly important sources of water for our farmers and for our communities. California might not be the agriculture superpower that it is without the ability to store rainfall and snow-pack during the winter months and then transporting the water to our fields during the dry months. Our water infrastructure is especially crucial to us during times of drought. Due to the lack of stored water (in Pine Flat Reservoir) there is a much higher need and cost to utilizing our water infrastructure and pumping the water that our fruit needs.